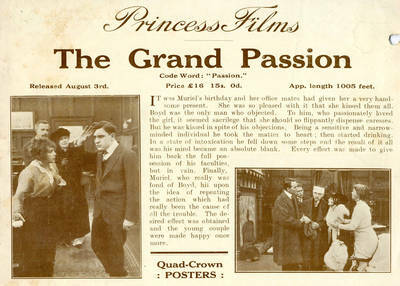 Thanhouser promotional piece for England presenting the Princess Film "The Grand Passion." Featuring Muriel Ostriche and Morris Foster. Release in the United States March 20, 1914 and August 3 in England. Offset prints; 5.5" x 7.5"